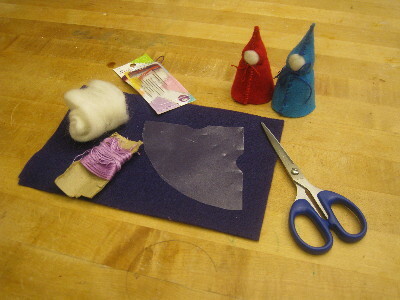 How to make very simple little felt gnomes! Recently I was at a friend’s house with just the younger lad, and we were playing with some cute little gnomes. They were enchanting in their simplicity and the kids adored playing with them. After a quick perusal of their construction I decided they would be easy peasy to make and how cool would that be for our monthly kids handcrafting group? 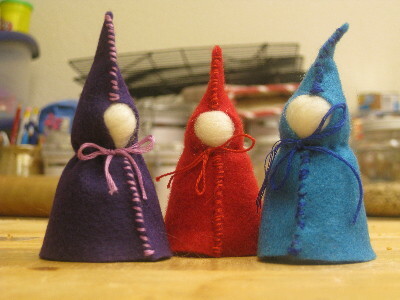 My friend said she had purchased them at a local Waldorf-inspired bookstore, so when I got home I looked up Waldorf gnomes. I couldn’t find exactly what I was looking for. There were a few tutorials for what I guess is a more traditional gnome with a wooden bead for a head, and I found some people more like what I was aiming for on Etsy, but nothing saying how to make them. I thought, well, how hard can it be? Turns out not hard at all! Literally, my five year old made one almost on his own. Then several people saw the pictures and asked how to make one, so I thought I’d do a tutorial. I’ve never done a tutorial before so hopefully this will look okay! Now, on to the gnomes! I made my own template after some experimentation. I ended up with a circle of a 4″ radius cut into quarters. I cut a reminder for a hole for the face but you can move this depending on how tall you want your gnome to be. 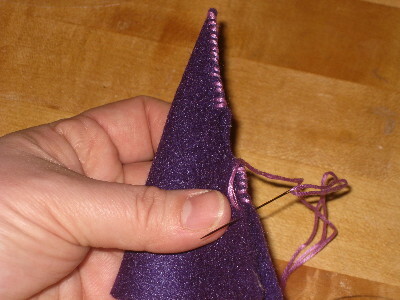 It’s easy to make shorter gnomes, just make the length down the sides shorter. I tend to cut out from the template first and then shorten. 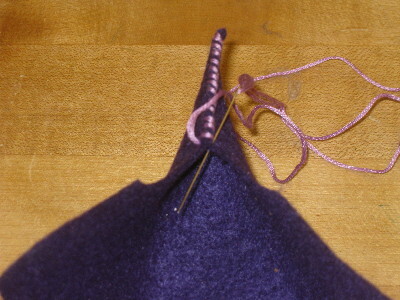 I tied a knot at the bottom of my thread and started at the top of what will be the hat in order to hide the knot. 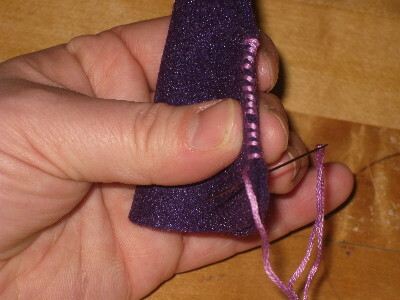 For the younger set it also works well if you tie both sides of the thread together at the bottom, creating a double thickness of thread, so the kids don’t pull the needle off the thread repeatedly causing you to go partially blind trying to re-thread that needle umpteen times! 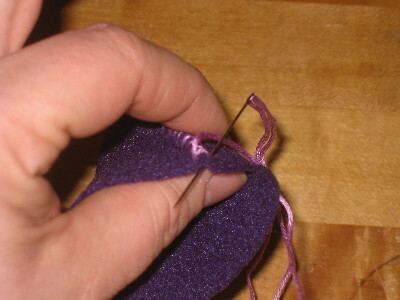 The stitching is done using a simple whip stitch while holding the edges together. Again, for the younger set, it worked well to use safety pins to hold the edges together. 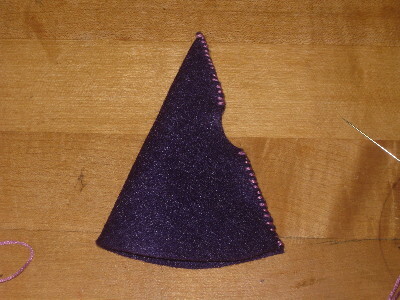 Keep whip stitching down the sides until you get to the top of the face. 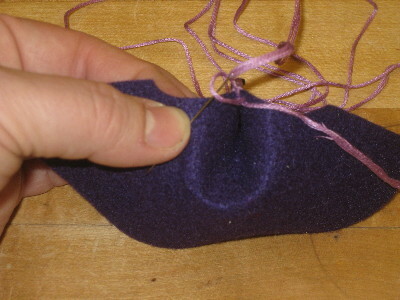 Then go through only one edge so that the needle is on the inside of the hat. 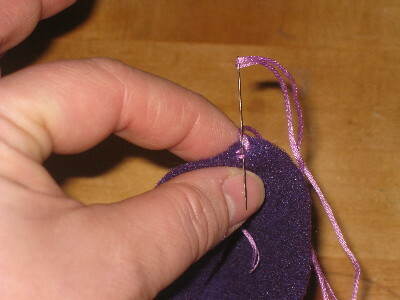 I tied a knot through one of the interior stitches and cut it with a bit of tail. I figured the tail would get hidden by the wool, but you can also tie more knots to your comfort level and thread the tail back through the previous stitches. 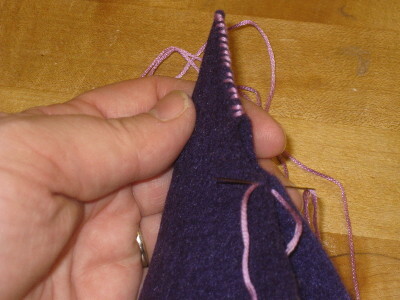 Next start below the face the same way — knot on the inside, whip stitch down the front. 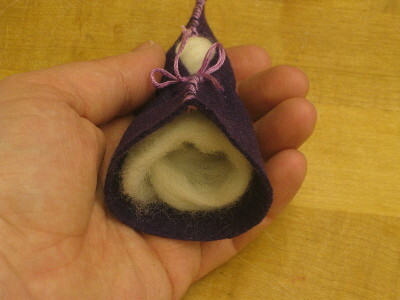 Incidently the first gnome I made was a) very, very small (2″ radius), and b) I didn’t cut a hole for the face. I figured if it wasn’t stitched up it would be open and therefore make a face. Which was true, it did — just not a very big face! 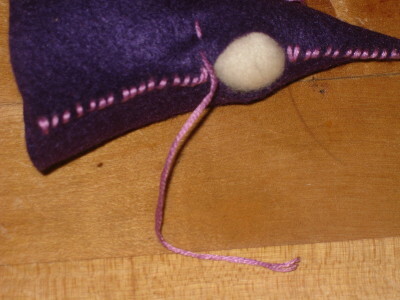 Opening up the face with some crescents cut into the fabric helped a lot. Keep whip stitching down the front. 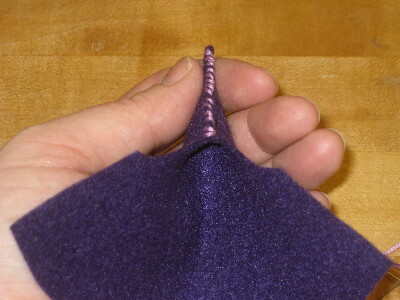 Another tip: To make the whip stitches horizontal, bring the needle across horizontal and angle down for the next stitch. I know that’s probably obvious but if I wasn’t paying attention I would start going across at an angle and bringing the needle out at the horizontal which resulted in a slanted whip stitch. Not that there’s anything wrong with slanted whip stitches, I just liked the horizontal look better! When you get to the bottom, tie off the same way as you did at the hat, i.e. 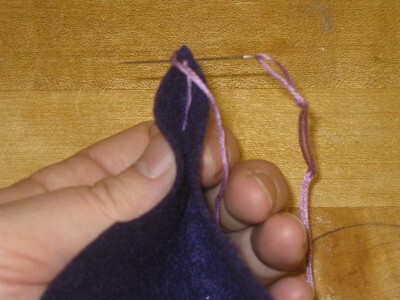 bring the needle through just one side of the felt, and tie a knot through the back of a previous stitch. Tada! 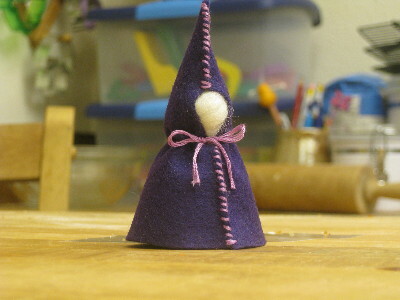 Sewn up gnome clothes. 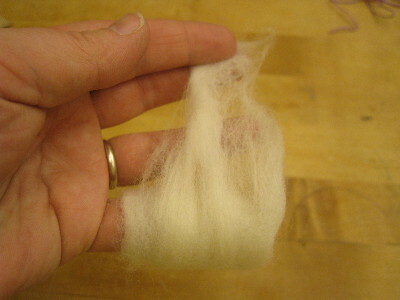 Next, roll your wool into a little bundle. I use my fingers but chopsticks or pens/pencils work just as well, if not better! 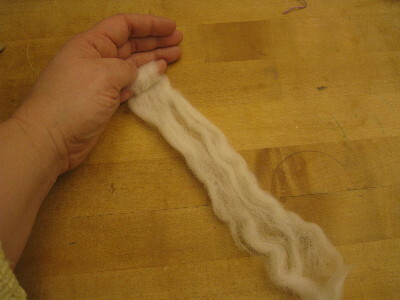 For my five year old I had him wrap it around his pointing finger so he would be ready to insert the wool when he was done. Next push the wool up into the gnome. You might want to play around with positioning so that the face has a pleasantly smooth surface and the wool is tucked up into the body. 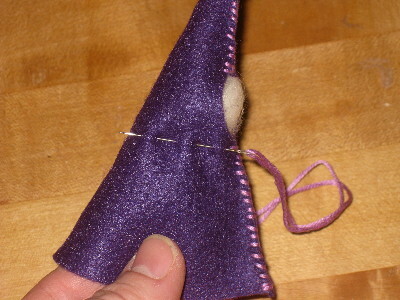 Next you define the neck with some simple running stitches around the gnome under the face. Leave a tail of a couple inches to tie the bow. 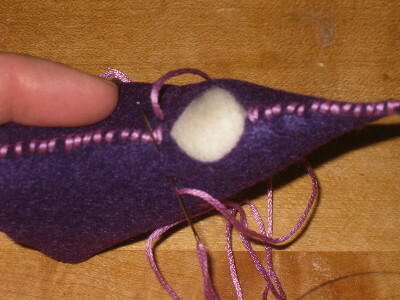 When you get back to the start, cut the thread off with another 2 inch (or so) tail. Tie loosely and pull hard on the tails to pull in the neck. 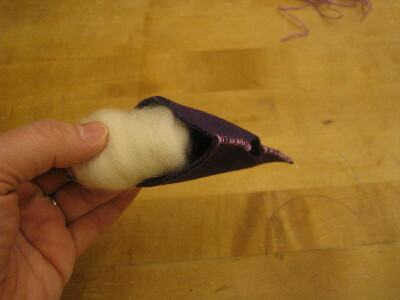 Then just tie a bow as best as you can and clip of the tails however long you like them. So there you go! I hope this was helpful in making your own little gnomes! This was a great project for our crafting group. 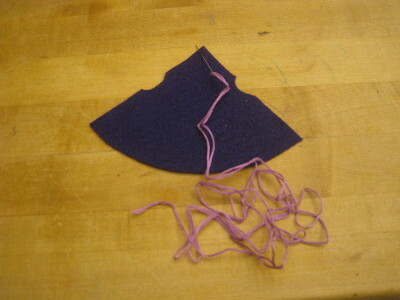 Everyone enjoyed digging through felt scraps and embroidery floss to pick out their colors, and even children as young as three were able to sew these mostly on their own, needing help with knots and re-threading needles. Such a great, simple project with a lovely and sweet result! They’re great fun to play with as well 🙂 Next I hope to make some sort of playmat or even a little tree playhouse sort of thing. What a great idea! These are adorable. Thanks so much for the tutorial!!! You are so crafty! Thank you for sharing that. It is going in my stack of vacation craft time projects. WOW oh WOW! I`m loving these , will definitlry make them for our next HS lesson , thanks…wouldnt these be great gifts for kids to take home after a birthday party ? (made by themselves)??? 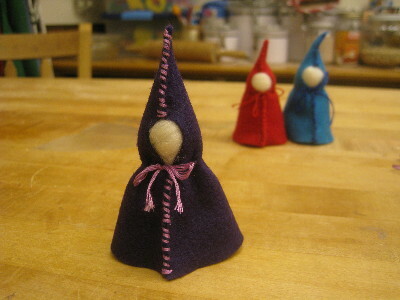 these are adorable…can’t wait to sit down with the littles and make some…thanks for your CLEAR instructions and photos! 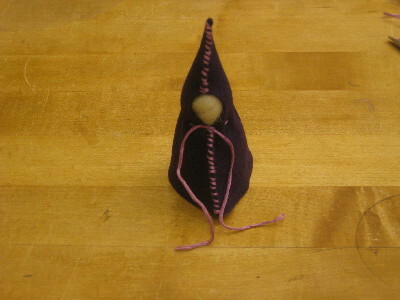 Found you on The Crafty Crow….Adorable!! Thanks for the tutorial 🙂 I can’t wait to make these, they are going next on our ‘snow day craft list’! I’ll be reposting! Yay for sweet, wee gnomes! My five year old made 3 almost entirely by herself. She scavenged some apple tree sticks to fashion them into puppets. Such a great tutorial. Thank you!